If you love the Harvest Moon series but wanted something with gameplay outside of farming simulation then you’re the target audience for Rune Factory: A Fantasy Harvest Moon. As the name of the game suggests it combines the farm simulation aspects of the popular Harvest Moon and mixes in fantasy style RPG elements. In Rune Factory players will have the opportunity to explore the small town of Kardia which is mostly made up of farmland. Players assume the role of Raguna (a name that can be changed by the player) after he wanders onto the property of Mist with no memory of his former life and barely alive. After saving his life Mist offers the player a patch of land and a house provided he works on the farm. From here you adventure in Rune Factory is your own, with plenty of different activities to pursue from the obvious farming to exploring, fishing, capturing monsters, improving your house or attempting to marry one of the girls in the town. All the while the underlying plot will have players learning more about the towns origins and their own (which advances as players defeat various dungeon bosses). Other gameplay and mechanics are borrowed almost exactly from the Harvest Moon series so you won’t have too much of a learning curve in that department. 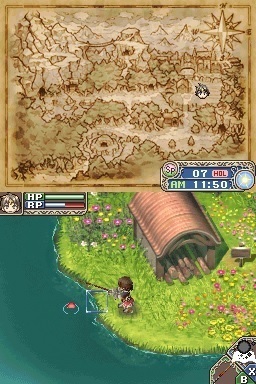 The two most obvious mechanics from the Harvest Moon system is the stamina depletion when performing activities and the time ratios from real world time to game time. 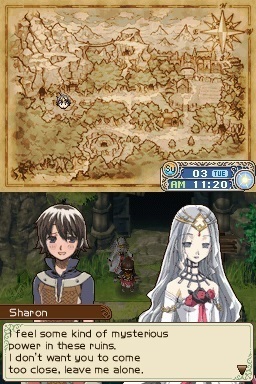 The fantasy and role playing elements of Rune Factory mix perfectly with the standard (and well loved) Harvest Moon farming simulation mechanics. Ultimately you end up with an impressive adventure that is just full of freedom. If you’ve played the Harvest Moon series to death and need something fresh then this is the game for you. Combines Harvest Moon with fantasy RPG mechanics. Battle monsters or capture them for your farm. An interesting adventure that unfolds at your own pace. Great freedom with plenty of different activities. A game for the Nintendo DS.